Welcome back! Wow! The response to our first challenge was thrilling! 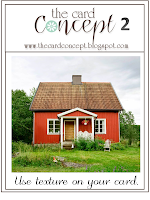 We're so happy that you like this innovative concept that Lesley came up with! To translate this photo into a Clean and Graphic card, I chose to focus on colours of the house. With CAG, less is almost always more, so there's no need to make sure that every element from your inspiration is included. I added texture in a couple of ways: first, I ran the strips of Suede and Poppy through my Cuttlebug with my Grosgrain Ribbon texture plate. Having the same texture on the whole panel helps to keep it clean. I cut out a heart from the main panel and then another to create a white frame like the white trim around the door. The main panel and the heart are popped up with foam tape (the second type of texture). Even adding a tiny touch of Stickles around the edges creates subtle texture and certainly adds some sparkle! This challenge will end on Monday, February 3rd at 3pm EST. LOVE your interpretation of the photo. That card is beautiful! The gold on the edges of the heart add a lot in a simple way! Ardyth your translation of the inspiration photo is fantastic, love that you used your signature Stickles! This rocks! I especially love how the white space echoes the door - a detail I probably never would have noticed otherwise! Oh Ardyth...less really is more with your beautiful card...love the impression plate you used and I loved your suggestion to make sure that every element from the inspiration is included. I can totally see that with your card...love the gold glittery around the heart border too. Gorgeous card, of course, from you, but that gold around the interior edges totally takes it up a notch! I am always fascinated with your tiny details. So glad to see you at CAS-ual Fridays! Brilliant design, bright bold and WONDERFUL! The Stickles rock...and so does the grosgrain EF. I actually had to scoot back to the photo to 'see' the white door frame....which I totally missed until I read your post! Awesome interpretation of the photo in the texture of the roof and the colors! I absolutely adore this card. The texture is perfect, and I love how you mimicked the trim on the door with the white part of the heart. Who makes that Grograin IP? Details, details perfect! Love that subtle impression on the card stocks and the sparkle around the heart, wow, love it! 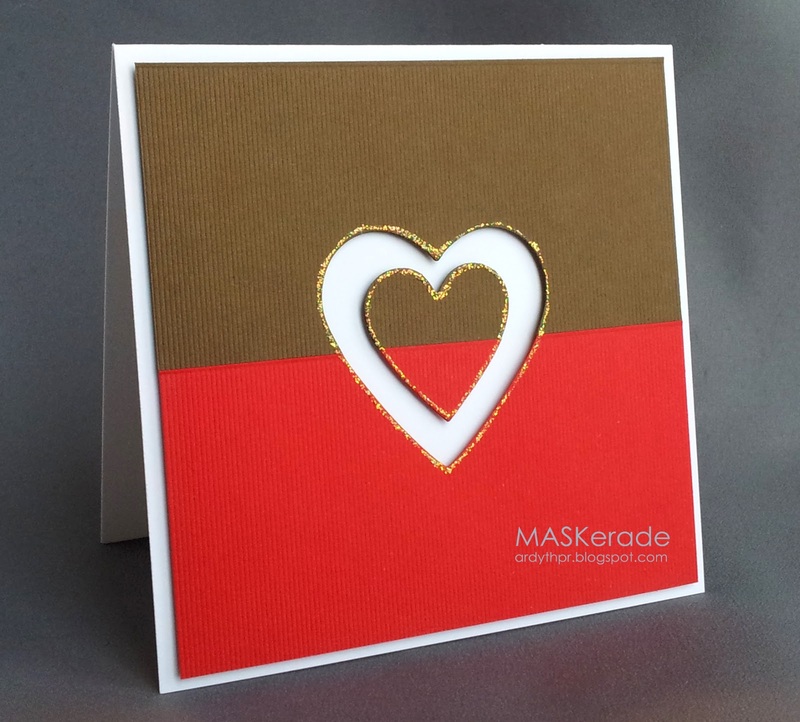 You ACED this challenge...love that gold on the heart and the paper is perfect! WOW...what else can you say, this is just incredible. A 'Wow' card, Ardyth! I love the grosgrain texture plate that you used; I have not seen that before, but how wonderful it is, adding just the right amount of texture. As always, I'm in awe of your perfectly straight lines! Love the stickles! Love how you finished off the edges of the heart!